Tiramisu is a gorgeous decadent Italian dessert. I am not gonna lie – this raw tiramisu isn’t the easiest of desserts you can whip up, but it’s so worth it. With almond-coffee lady-fingers, rich cashew cream layered in between, and a light dusting of cacao, this vegan tiramisu will impress everyone. 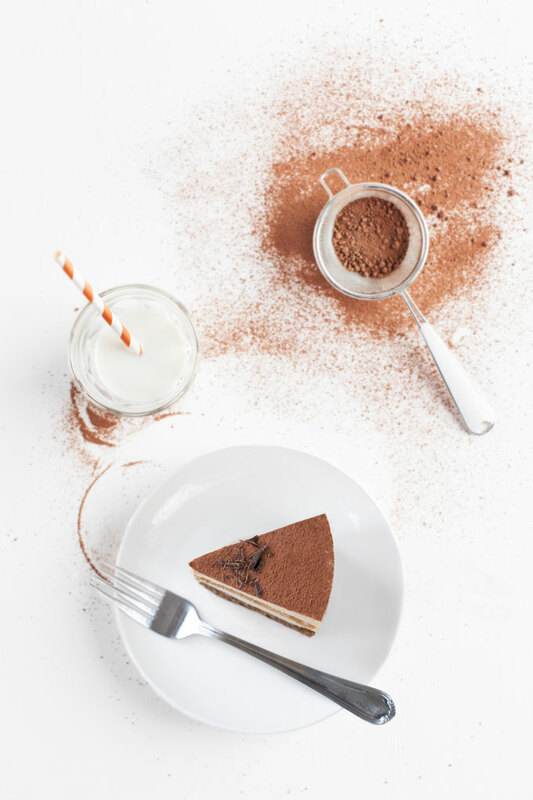 If you’re not a fan of coffee, but still want to enjoy a raw dessert, you can always try my raw chocolate brownies, raw lime cheesecake, or raw carrot cake. I have always loved the aroma of freshly brewed coffee – rich, full, and luxuriant. Coffee smells like chocolate tastes. Unfortunately for me the taste of coffee has none of the depth, the subtleties, or the scope that the smell has. I only taste one flavor. Bitter. It’s not that I’ve only tried ‘cheap’ coffee. I’ve had really good coffee. I’ve had light roast, medium roast, dark roast. Fine ground, coarse ground. I’ve had instant coffee, coffee machine coffee, k-cup coffee, percolator coffee, espresso, mocha, latte, cappuccino … you name it. Until recently, I also avoided coffee-flavored anything because I always thought that coffee-flavored desserts would taste, well, like coffee. Bitter. That was before I had a bite of raw tiramisu at our local raw food restaurant and got hooked. The coffee flavor was rich without being overwhelming. 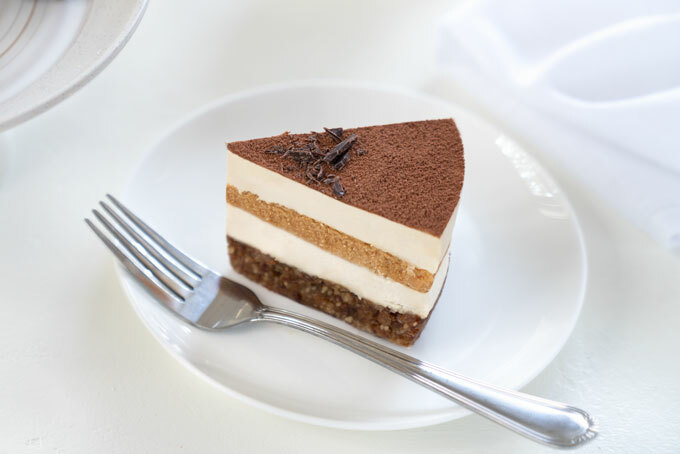 Its bitter edge elevated the tiramisu from one-dimensional sweetness to refined sophistication. The delicate layer of sweet vanilla cream contrasted with the dark, robust presence of espresso and sharpness of cacao powder… So good! There are so many ways you can add coffee to desserts. Whole beans pack the most flavor since coffee loses its flavor and aroma exponentially after being ground. For the most intense coffee flavor, I recommend roasting the coffee beans in the oven first (to encourage their flavorful oils to emerge) and then grind them in a coffee grinder right before use. Instant coffee and instant espresso add flavor quickly. Since I don’t drink coffee, I always keep a jar of this instant espresso powder in the fridge for making coffee-infused desserts, like this raw tiramisu. Brewed coffee works best when you don’t want an overpowering coffee flavor (because brewed coffee as the only coffee flavoring in a recipe doesn’t pack enough coffee flavor). To get the most flavor out of brewed coffee, I recommend using espresso because it has a strong, dark flavor. The great thing about coffee is that it pairs well with many dessert flavors. Coffee and cacao, for instance, is a very common pairing. In fact, coffee-chocolate combination has its own name – mocha. Cinnamon is also delicious with coffee; cappuccino often comes sprinkled with it. I also like to pair coffee and caramel-y Medjool dates because they’re both strong flavors that play well off each other. Besides these traditional coffee combinations, a few others stand out. Rich nuts, such as walnuts, pecans, almonds, or cashews round out the sharply intense flavor of coffee. The coffee flavor is less pronounced, but the addition of nuts creates a new and delicious flavor altogether. Adding vanilla to coffee desserts produces a similar result. 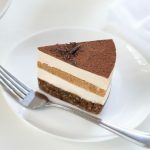 Just like classic tiramisu, this raw tiramisu is made of a few layers – coffee-flavored crust, vanilla-infused cream, ladyfingers with hints of both chocolate and coffee, and a light dusting of cacao. All you need for the crust and the ladyfingers is a food processor and a few pulses. The most important thing is to process the nuts until they are just broken down and incorporated with the dates. If you over-process the nuts, they will release their natural oils, making the crust and ladyfingers oily and too hard to work with. At the same time, the nut-date mixture does have to hold together when you press it in between your fingers. Since the original shape of tiramisu is round, I like to use a 6″/15 cm springform pan to shape both the crust and the ladyfingers. However, feel free to shape the ladyfinger mixture into whatever shape you like. You can even get a baking mold for ladyfingers. What’s more important than the shape is the texture. I like to process the ladyfinger layer just a tad bit longer than the crust. This results in a slightly crumbly crust and sponge-like ladyfingers. Classic ladyfingers can be either soft and cakey or dry and crispy, but they always have a sponge-like texture. The key to a smooth cream is to soak the cashews for at least 8 hours. Re-hydrated cashews blend into a beautiful smooth, cheesecake-like consistency. I’ve tried blending unsoaked nuts into creams and never achieved a completely smooth consistency (not even with my Vitamix!). If you don’t have a high-speed blender, you can whip up the cream in a food processor. However, a high-speed blender makes the cream much smoother. To even out the layers, use a spatula and tap the springform gently on the counter. Tapping the springform not only evens the layers out, but it also helps to get rid of any air bubbles that might have formed when blending the ingredients. Finally, I would recommend having the crust and the ladyfingers ready before making the cream. Just like fruit can turn darker when exposed to light and air, so can this cream. So, I always make the cream layer last and dust it lightly with cacao powder right after I pour it into the springform pan. 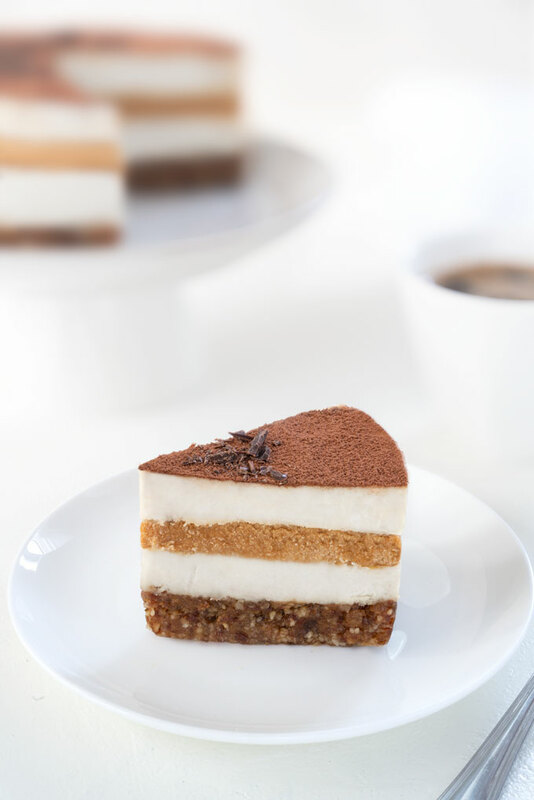 *I made several versions of raw tiramisu and took photos of all of them. Unfortunately, my husband accidentally formatted my SD card before transferring my last set of tiramisu photos (which happened to be the photos of this very recipe). So, I included tiramisu photos that are very similar to the ones I lost. The only thing that is different in these photos is the ladyfinger layer. Tiramisu is a gorgeous decadent Italian dessert. I am not gonna lie - this raw tiramisu isn't the easiest of desserts you can whip up, but it's so worth it. With almond-coffee lady-fingers, rich cashew cream layered in between, and a light dusting of cacao, this vegan tiramisu will impress everyone. Add all the crust ingredients into the food processor and pulse until the crust begins to stick together when you pinch it in between your fingers. Be careful not to over-process the walnuts, so they don't start releasing their natural oils. Scoop the crust into a greased 6" (15 cm) springform pan and press it down into an even layer with your fingers. You can also use the bottom of a glass to really pack the crust down. Cover the crust while you’re working on the next layer. Add all the ingredients for the ladyfinger layer into the food processor and pulse until the ladyfinger mixture begins to stick together when you pinch it in between your fingers. Shape the ladyfinger mixture into a 6" circle that fits on top of the crust (or any other shape you like). I have a spare 6" springform pan, so I use it as a guide for the ladyfingers. Place the ladyfinger layer into a refrigerator (or the freezer) for a few minutes, so it firms up and is easier to cut. Blend all the ingredients for the vanilla cream until smooth. Spread half of the vanilla cream on top of the crust and smooth it out with a spatula. Then place the ladyfinger layer on top of the cream (I like to cut the ladyfinger layer into 12 equal wedges, so it's easier to work with), and then spread the rest of the cream on top of the ladyfinger layer. Using a small fine mesh strainer. lightly dust the top of the tiramisu with some cacao powder. Cover the cake and let it set in the refrigerator for at least 6 hours or overnight to firm up. Store leftover tiramisu in an airtight container in the refrigerator for up to 1 week or in the freezer for 1 month. *Soak the cashews for at least 8 hours (or overnight) so they soften up and are easy to blend. If the nuts are not soft, the vanilla cream might turn out grainy and not completely smooth. When the cashews are done soaking, drain the water and rinse the nuts thoroughly. **Prep time does not include soaking the nuts (8 hours). Hi Petra, I was looking for the vegan version of tiramisu coz almost all the videos I came across had coffee and lady finger as the prime ingredient (as I don’t drink coffee either n I don’t like to). That was a wonderful vegan tiramisu recipe by you.. thanks a ton n hats off!! Keep posting more vegan stuffs..
Hi, there’s a coffee alternative called Roma, Postum, and Cafix. Its made from Roasted Barley and doesn’t have caffeine. Closest thing to coffee though. Can we substitute other dates for the Medjool? Hi Danielle – yes, you can use any dates you have on hand. Just make sure you soak the dates in warm water for a couple of hours first so they soften up a little bit. Any ideas? Thanks so much for the recipe Petra, I’m going to make your raw butter and chocolate smoothie tomorrow, so much appreciate your beautiful videos (and your wonderful taste tester too 😉 !! Oh, P.S. I soaked the nuts in total for about 20 hours, could that have the opposite effect perhaps, making them grainy? Hi Tasch, thank you for your kind comment! I am so happy you’re enjoying the videos ❤What nuts were you using? Raw or roasted? What is the wattage of your blender? I would like to compare it with mine. The problem isn’t over-soaking for sure. If anything, the longer soaking time would help getting the nuts nice and smooth. Now, you said that the mousse was not pourable. I am wondering if the mixture seized up? Was it really thick, almost like a paste? Seizing would also explain the grainy texture. Did you put all the ingredients for the mousse into the blender at once or did you blend in stages? And did you use any other sweetener other than the dates? I know it’s a lot of questions, but your answers should help me pin point the problem. Thank you once again for your kinds words! Wow, thank you so much Petra for this kind of detail. The mousse was thick like a paste, yes. I had to scrape the whole lot out of the processor. I put all the ingredients in the Vitamix at the same time to blend, perhaps I should try in stages next time. Ok, yes, so if the consistency was like a grainy paste, it definitely seized up. (Nothing to do with the power of your blender). I put all the ingredients into the blender at once too. That’s not a problem, rather the opposite. Here is why: as you might know, most of the chocolate we get these days is an emulsion of the cocoa solids (among various other solids like sugar, etc.) and fat (generally the cocoa butter). Most of these solids do not prefer to mix with water. So, when you add a little bit of water (in our case, almond milk) and stir it these particles of cocoa solids and other stuff will be hydrated, like wet sand; capillary attraction keeps the solids together and in a clump. If you add enough water/almond milk, the solids will disperse sort of evenly in the water. Alright, so two solutions to fix the problem of clumping – use ingredients that are at the same temperature so you don’t “shock” the chocolate. Was your almond milk or coconut oil cold? Just that little tweak (having all ingredients at the same temperature) could fix the problem. If that doesn’t help, you can always recover seized up chocolate by adding more liquid to loosen the mixture back up. Just be sure not to add too much liquid because you still want the mousse to hold its shape once it’s had some time to chill in the fridge. Oh THANK YOU SO MUCH PETRA!!! for this very helpful and thought out answer. Yes, you’re right, the almond milk was cold! I think I remember you saying something about that in one of your videos (it could even be this one?) I didn’t watch the video as I made it because I had already watched it previously so I just went through your instructions from this page. I will definitely try all the same temps next time. This cake looks fabulous and I want to give it a try. Do you think that I can substitute the walnuts with almonds? Hi Steliana – I like walnuts because they are softer than almonds, but almonds will work too 🙂 Hope it turns out great! It was a surprise for me that I made it fast and it wasn’t so difficult as I expected it! The taste and the texture are perfect! So delicious!! It has very good sweetness (if you make it exactly as in the recipe proportions) and despite the fact that it’s from nuts, it’s really light for digestion! Definitely I will make it again and again! My friends didn’t believe me that I made it in my own! And it was a big compliment for me! I had to assure them that I didn’t buy it! Thank you so much! As usually I cannot find words to describe my happiness and gratitude!!! Amazing! I’ve made this cake 3 times and even once without the esspresso for just chocolate cake. Everyone in my family loves it! Today I used your recipe for the vanilla layer (subbing ghee for the oil) and adding 1/4 cup of coconut flour to make an edible chocolate chip cookie dough! Yay! So happy you like that recipe, Jenn! Thank you so much for the feedback! ❤️﻿ I really appreciate it. Dear Petra, I’m so surprised about this new recipe of Tiramisu!! I make so often your previous one! Our house smells espresso and chocolate every week! I love the previous recipe of Tiramisu but I want so much to try this one as well!!!! Could you kindly tell me if I can replace the almond flour with a coconut flour? Thank you so much for for your great work which you share with us!!! Hi Evgenia – I usually try to adapt recipes based on your guys’ feedback. I got a lot of comments on my YouTube channel about making raw tiramisu with a ladyfinger layer, so I did 🙂 I hope you enjoy this recipe just as much. Yes, I think you can sub the almond flour for coconut flour. The only thing you might need to change is the amount you use. Coconut flour is a bit denser and heavier than almond flour, so start with less and add more as you go. Dear Petra, I appreciate so much that you find time to answer to our questions! Thank you a lot for your advice, it helps me a lot! I’m going to make this Tiramisu in some of these days and I will try to substitute the almond flour for coconut flour. I will send you the picture when the Tiramisu is ready! Thank you again so much!!!!! Hi Petra, I’m new to raw and vegan baking and so keen to give this recipe a go. I have a question about alcohol. I’ve read that some wines are raw and vegan but I’m not sure how you can tell. I’d like to add a little marsala to the ladyfingers, like you would in a traditional tiramisu. Would doing that keep the recipe true to a raw and vegan diet? is micaela from italy… country of tiramisù! Your videos are great and have done a lots of the raw desserts, but please could you tell me how to stabilize the cheesecake. As soon I take it of the fridge and it is getting very soft. Do you use agar or something else. Hi Sonia – did you let the cheesecake set in the freezer? I always let the cheesecake set first and then take it out to soften (either on the counter or in the refrigerator). The coconut oil and coconut cream are what keeps the cheesecake filling “solid” when stored in a cool place. Please, let me know if you have any questions.